Other than head-on collisions, rollover accidents are the most deadly type of auto accidents that people get into. Many of them end in fatalities. There are many things that can increase or decrease your odds of getting into a rollover accident, but it is important to first understand the basic science behind it. Studies show that S.U.V.’s are extremely more likely to get into a rollover accident than compact cars and sedans. Why is that? It is because of basic science. The two physical traits that make a car more likely to roll over are a high center of gravity, and a narrow base. Think about it, if you had a four-wheeled vehicle that was twenty feet tall, and it was very heavy at the top, and it was only 4 feet wide on its base, do you imagine that it would fall if it took a corner quickly? Of course it would. It is basic enough physics that we can apply what we know about life and the way things move and we can image that vehicle trying to turn and we can see even in our own head that it will fall over. Now, imagine a vehicle that is only two feet tall, all of its weight is near the bottom, and it is eight feet wide. Will that vehicle turn over making a turn? Highly unlikely. The reason is that physics will not allow that vehicle to turn over unless it was traveling at such a ridiculously high speed that there was no other option. That is why S.U.V.’s are the most likely to rollover when they get into serious accidents. Not only are they tall, but their weight is raised up to the top because they are made to be high off of the ground for off-roading purposes. Trucks are bad too, but not as bad because they are not as heavy. Vans are also worse than cars, but not as bad as S.U.V’s because they are not raised up. Cars that sit low to the ground with a nice wide base are by far the least likely to roll over. There are other factors that can contribute. The first of which is aggressive driving. If you drive crazy, you are more likely to get into a rollover; in fact, many rollover accidents are single car accidents, meaning that no other car was involved. The driver simply lost control. The two biggest factors that can lead to a quick loss of control and a resulting rollover are: 1) overcorrecting, and 2) hitting a “trip.” Many times a driver will notice that they have swerved one direction and they will quickly swerve back the other way. This is overcorrecting; it will cause the tires to go the opposite direction too quickly for the momentum that the vehicle is driving with. It causes rollovers all the time. The second problem is hitting a trip. This can be a curb, or a rock, or even another car, anything that will cause the car to suddenly drive on uneven ground and will disturb the cars balance. For example, if your right tires are riding right along a steep curb, and you attempt to turn into the curb, and there is nowhere to turn, your momentum could cause your S.U.V. to rollover. 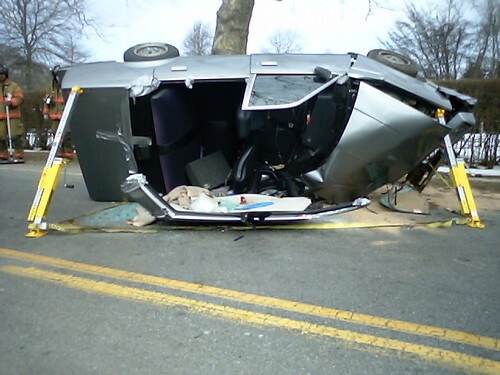 Many rollovers happen to male drivers under the age of twenty-five and they often involve alcohol. Drive safely, rollovers can be incredibly dangerous because you become susceptible to being crushed by the roof of your own car. If another driver has negligently caused you to rollover, or you have been in a vehicle that rolled over because of the fault of your own driver, call an experienced car wreck lawyer who has worked with rollover clients. Liability for a Road Rage Incident If you want to, you can do that!